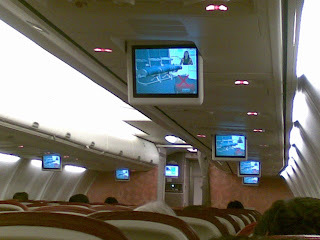 On the Air-India flight from Mumbai to Chennai- Saw in flight enterainment systems dishing out videos of safety instructions. It was good in a way, as no one is in the mood to see aunties giving instructions at 10 pm in the night. The so called-in-flight-entertainment was some archived videos of some lion roaming for food in a forest without any audio. The best inflight entertainment on domestic flights has to go to Jet Airways on the Mum-Chennai route, followed by Kingfisher which provides Live Television on board. 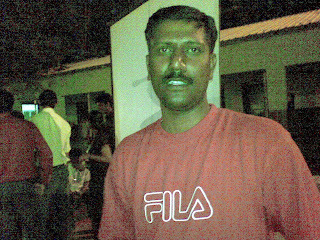 One of the reasons for a Chennai trip on the 26th-28th weekend was my school alumni meet. 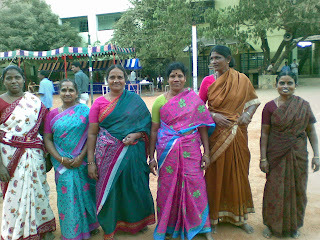 This was the first time such a thing was happening in the history of Bala Vidya Mandir(Adyar). I decided to go to school, as a lot of my formative skills were developed largely because of the oppurtunities I had in school, may it be talking on stage, quizzing, playing cricket and a few other small things. From Left to Right, are my school Aayas, who used to let me inside their house(inside the school compound) to watch the cricket updates, take care of me when I was waiting alone, for my parents to pick me up, help me with lunch sometimes when I spilt it as a kid on the ground, and a score of other things, that i would remember them for. Thats me and my maths sir. This is the way he introduced me with pride to some of his other students " KK used to start sleeping at 9 am and get up when the bell rang at 4 pm very promptly". He used to tell me that the only way, I could improve in life was to have a pot with a small hole, so that the the water keeps trickling down on my head to keep me awake. Well, there are times I feel droswy at work still, and nothing much has changed since then. 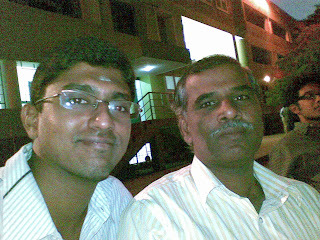 ur post fills me with nostalgia...unfortunately cudnt attend the school alumni meet...but ur pics kinda make up 4 it...many thanks!!! Looks like RR sir always pulls students in!